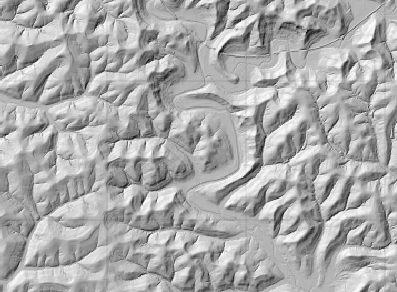 In general, I like the results from the hillshade. 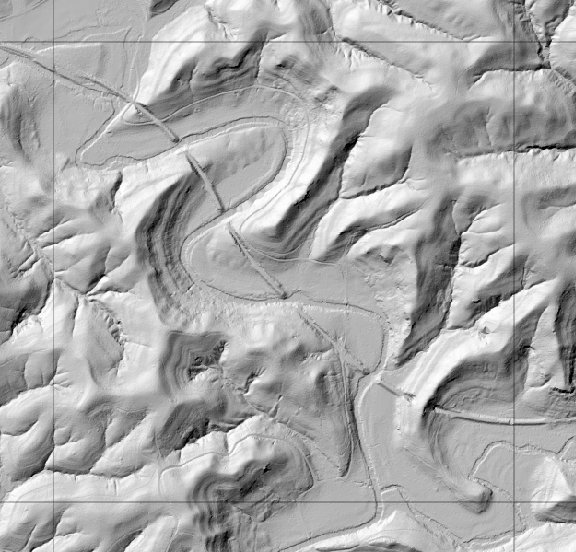 One problem that I forgot to take into account– hillshade algorithms typically leave a 1-pixel border along the edge where calculations cannot take place… . For this Ohio dataset, that means that every 5000 feet or so (the x and y dimension of our DEM chunks), we have a 2-pixel wide line, resulting in a subtle and interesting grid. Now this is a state plane grid, so I might be able to pretend it’s intentional… . Maybe I need to mosaic the DEM and then compute hillshade. Ha! Nice call. That is indeed in the venerable Vinton County.